The Motorcycle Museum is located in the center of the Gothic Quarter of Barcelona, with an exhibition area of 600m2, full of "Passió by les dues rodes" - in English "passion for two wheels". Barcelona is the city with most motorbikes per capita in Europe. This is because of, among other things the density of the city and the chaotic traffic, which makes it difficult to get around the city with a car. So the Catalans prefer the two-wheeled options, such as motorcycles, scooters and bicycles in addition to public transport. This long-standing motorcycle culture is reflected in the Barcelona-based Moto Museum, which was established in 2011. It is an extension of the Moto Museum in Bassella (Leida), which has been open since 2002. The focus of the museum is on the history of the motorcycle in Catalonia. For example, several Catalan Motorcycle Brands are on display, as well as paraphernalia from known Catalan drivers. In addition to the large permanent exhibition on the history and tradition of the motorcycle, there are also several temporary exhibitions. 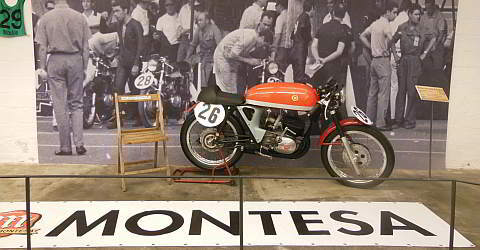 For example, the exhibition "24 horas de Montjuic", a motorcycle race, which took place in Barcelona between 1955-1986. The race track on Montjuïc was closed after racing driver Domingo Parés' fatal accident, whereby the track was deemed to be too dangerous for drivers and spectators. The new race track "Circuit de Catalunya" is now located just outside of Barcelona and also serves as the venue for Spain's Formula 1 Grand Prix. The Museu Moto offers a varied mix of exhibits and information on the history of the motorcycle in Catalonia, which are structured in a chronologically arranged tour. The museum also boasts an integrated museum shop, and offers guided tours on request. With the Barcelona Card you get 15% discount. For the museum you should schedule about 1 hour.